California is a big and diverse state and it’s home of several unique national parks. Like Sequoia, the land of giant trees, Yosemite, the land of waterfalls or Death Valley, the hottest place on Earth – just to mention the most famous ones. But California has a lot of state parks as well (roughly 200 is a lot, right?) that are not nearly as well-known despite of the special beauties they offer. Coastal views, deserts, redwoods, marshes, hills, lush green forests, alpine lakes, interesting rock formations, rich wildlife and marine life – you choose. We’ve lived in California for a year and like any good Californian we’ve spent as much time outdoors as we could. So we decided to introduce our 6 favorite state parks to you. On a sidenote, it was very hard to choose just 6 even though we’ve visited only a fraction of the parks (almost 30). For a full list and more information about entrance fees and opening times visit the California Department of Parks and Recreation website. California’s High Sierra is full of wonderful parks and majestic landscapes and Lake Tahoe is one of our favorite region. With its 1945 ft (593 m) depth Tahoe is the second deepest lake in the United States after Crater Lake. It’s located on the border of California and Nevada and though it’s not a national park, there’s a bunch of state parks and even a designated wilderness area in the region. D. L. Bliss and Emerald Bay State Parks are two small parks right next to each other. They include more than six miles of Tahoe’s west shore – the most beautiful part of the shoreline in our opinion. 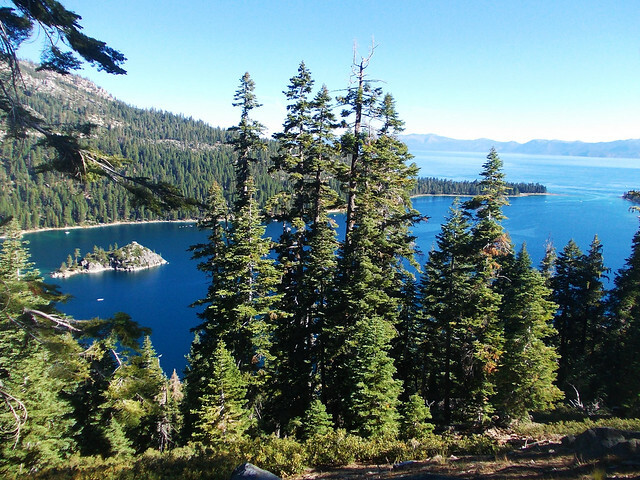 Rubicon Trail led us along this shoreline including Emerald Bay and this is the hike you don’t want to miss if you visit Lake Tahoe. Okay, of course, you can miss anything you want but this was the hike that made us fall in love with Tahoe. You can also choose from several activities other than hiking like kayaking, paddle boating or swimming (if you dare! it’s an alpine lake…). California’s Pacific Coast is magical all along! If we have to choose our favorite section though it would be Big Sur. 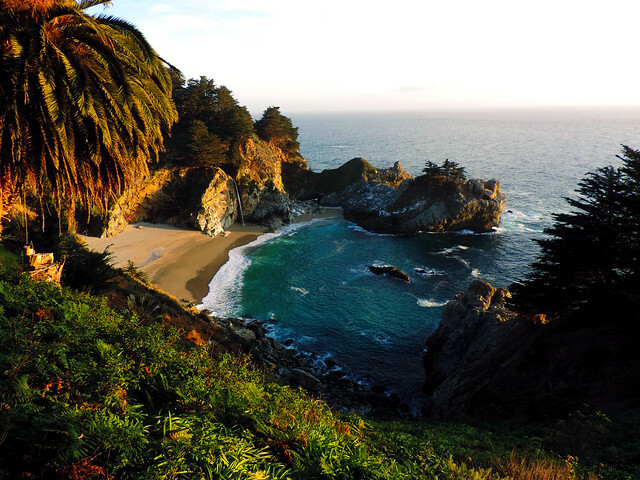 And Julia Pfeiffer Burns State Park is one of the most iconic places of Big Sur because of MyWay Falls. This is the picturesque waterfall I bet you’ve already seen in a bunch of pictures and you probably wondered whether it’s real or on which tropical island it could be. Well, California is the answer you’re looking for. The Waterfall Overlook Trail is very short but it will take time until you get bored with the views. (No, you won’t until sunset but that’s fine. You can wait until sunset, too. Ocean sunsets at Big Sur are stunning!) There are some more trails in the park, like we also discovered Ewoldsen Trail that led us to a pretty redwood canyon. Andrew Molera is another state park of Big Sur. We started our exploration from the parking lot towards the beach. There’s Big Sur River to cross on the way and then just follow the trail to the beach. Several short and easy trails allowed us to see the best of this park. Beach Trail from the Big Sur River mouth to Cooper Point is the easiest. 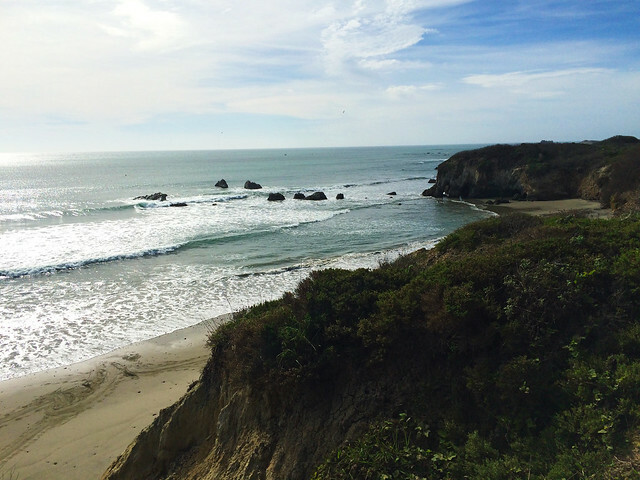 Bluffs Trail and Headlands Trail offer amazing ocean vistas. Big Basin and Portola are actually two parks but they are quite close to each other and they are both famous for their majestic redwoods. So we list them together and you can easily visit both of them on the same day (that depends on the length of the hikes you choose though). Redwoods are the tallest trees on Earth and they may range from 1000 to 2500 years old. 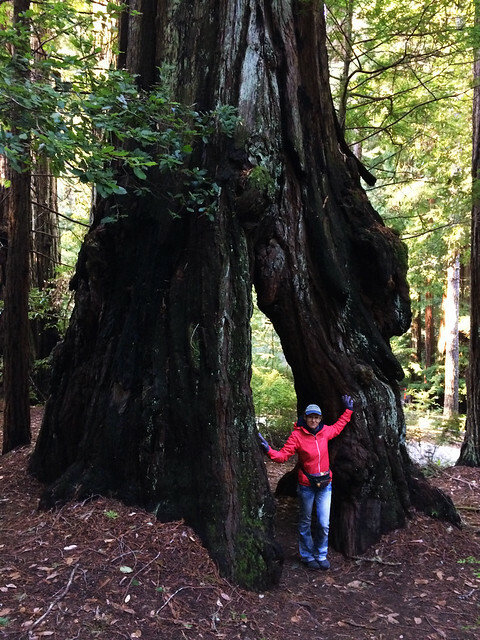 Though the oldest redwoods can be found in the Redwood National and State Parks of Northern California but these two state parks can definitely impress, too! A bunch of hiking trails led us into the solitude of the giant forest and we also enjoyed discovering the meandering creeks and lovely waterfalls. 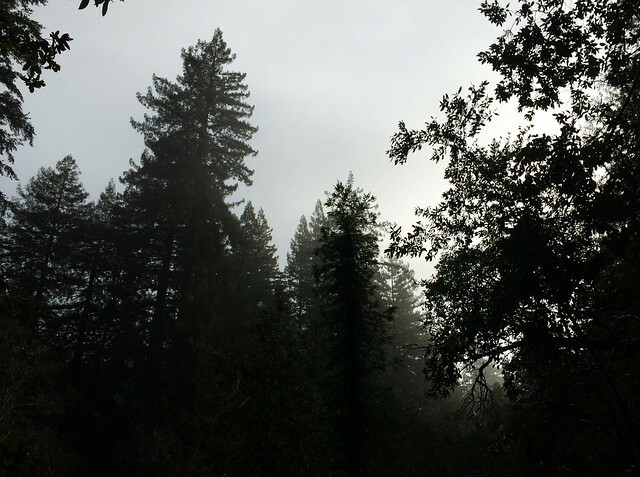 Our favorite hike is the strenuous and spectacular Berry Creek Falls Trail in Big Basin. 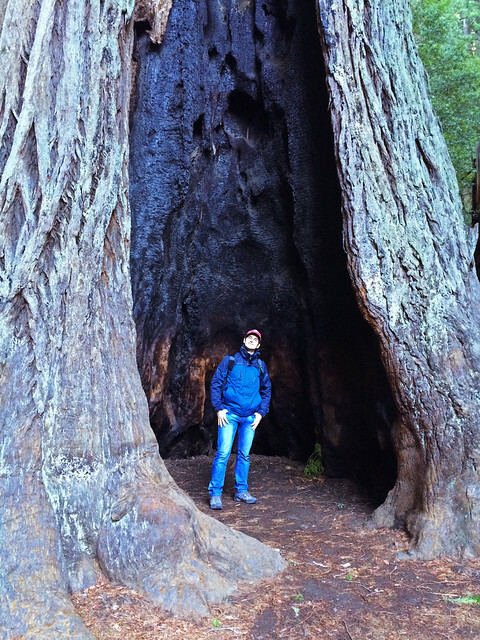 It passes many of the largest old-growth redwood trees and four waterfalls. Waterfalls can almost dry out in summer and they are the nicest after winter rains. 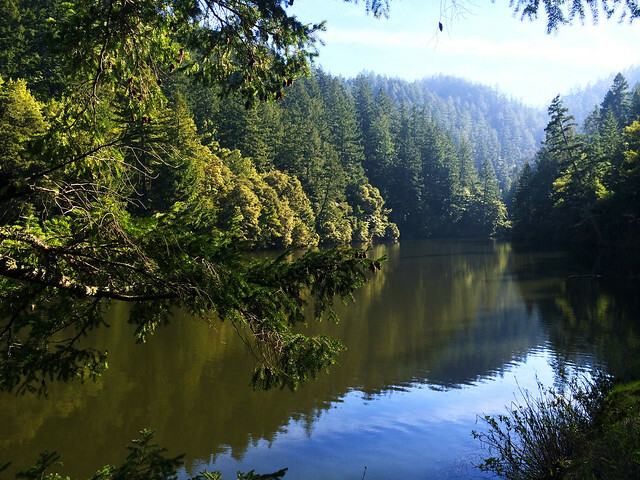 Mount Tamalpais State Park is north of San Francisco’s Golden Gate Bridge and it’s a huge park with redwoods, ravines, grasslands, hidden creeks, lakes and hilltops with panorama of the San Francisco Bay and the surrounding hills. Fog often covers the lower area of the park in the morning and it looks like a soft white blanket from the hilltops. 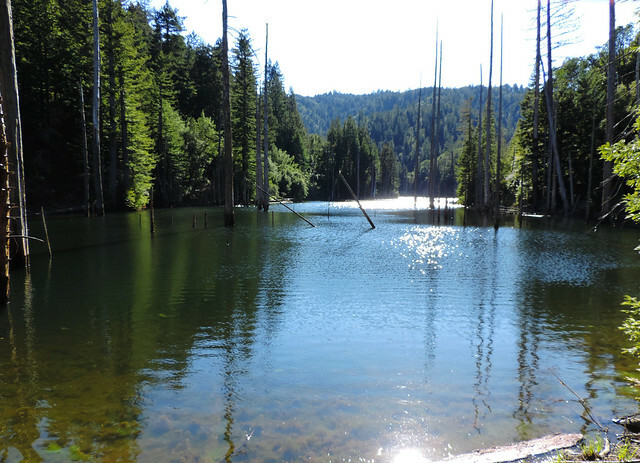 Our favorite trails are Cataract Creek Trail to Alpine Lake and the Carson Falls – Kent Lake route. And we liked this park the best in winter and in spring because everything gets lush green after winter rains and wildflowers are spectacular in spring. Año Nuevo State Park is one of the pretty coastal parks and what makes it really special is the elephant seals. Every year up to 10000 elephant seals return there to breed, give birth and molt their skin. The dunes and beaches of the park can only be visited with a guide during this most exciting period of the year that lasts roughly from December to March. Elephants seals are so weird and their tiny black pups are the cutest creatures on Earth. (I’m lying, sea otters are the cutest… 😛 ). Finally, of course, we can’t stop at 6. But at least we are good at making up excuses. Because Torrey Pines is a bit different from the parks we’ve mentioned so far: it’s a natural reserve. This fragile environment is strictly protected and is home of a very rare pine tree (Pinus torreyana). 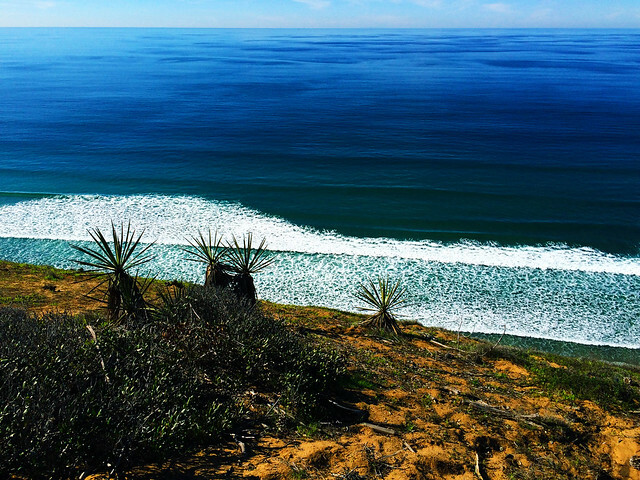 Though its greatest natural value is probably this pine tree species, we were amazed by its high broken cliffs, deep ravines, stunning ocean views and Torrey Pines State Beach. And all this is not even 30 minutes drive from San Diego. Have you been to any of these parks? What are some of your favorites in California?